There are a few commodities that are targeted quite often in preparing revenue proposals of the government budget. Among them, cigarettes and liquor have been most common. Traditionally, both traders and consumers anticipating tax increases on cigarettes and liquor, begin to respond even before the day of the Budget Speech. 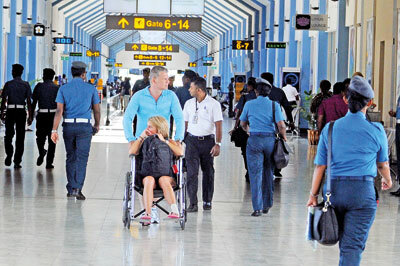 File picture of the Colombo airport. Consumers would rush to the boutiques to buy a few more cigarettes, and to the liquor shops to buy an extra liquor bottle before the prices go up after the next day Budget Speech. But they often had to turn back with disappointment, as they found that there was already a shortage of such commodities in the market. Owners of the boutiques and liquor shops, on the other hand, used to pile up stocks and hide them, pretending to their customers that cigarettes and liquor were all sold out to panicked customers. The day after the Budget Speech, the shortage is over and the traders then make some extra bucks by selling cigarettes and liquor at higher prices. Because the markets have become more competitive, such practices are not common today. At the same time the importance of the government budget as an instrument of altering commodity prices with taxes has also declined. But nevertheless, the revenue requirements still depend largely on taxes on commodity prices. The latest addition to the commodities that can easily generate government revenue is the passports. Because there are no taxes on passports, the government can simply raise the fees of issuing passports and, of course, the government has been doing so. What is so common between the commodities like cigarettes or liquor and passports? The government knows that “passports” as a commodity can surely generate revenue. Let’s examine this interesting case today from an economic perspective. In the good old days, passports did not receive much attention as a revenue source. This was because not many people travelled overseas so that not many passports were issued at that time. Foreign travel in many developing countries was not for general public, and was limited largely to politicians, bureaucrats, and military officers. The cost of their foreign travel was, anyway paid by public money; there was no need to impose such fees for passports too. There was a segment of the rich population who also travelled abroad. By the way, some developing countries used to build a separate pavilion aside within the airport premises for the general public so that they can come and watch planes taking off and landing. The airports were not designed for common people either so that there was no proper public transport connectivity to the airport. Neither was there common facilities inside the airport such as restaurants open to the general public at affordable prices. Those days, the governments in many developing countries must have never thought that there would be a time when more common people than anyone else will be using the airports. Even if it has already happened, some airports have hardly changed their initial outlook in order to serve the common masses. There are tourists, pilgrimage travellers, small businessmen, migrant workers and students in the airports of developing countries in Asia. As far as Sri Lanka is concerned, over 1.4 million Sri Lankans per year are travelling overseas, according to the departure statistics in 2017. Among them, there are more than 200,000 departing for foreign employment. About 300,000 Sri Lankans visit India every year, according to India’s tourism statistics. I believe most of them are visiting India for religious and business purposes. Secondary to the top two tourist-originating countries of India – the US and the UK, Sri Lanka stands on par with Australia, Canada and Malaysia in third place, as all these four countries generate similar number of tourists a year. Another large group of Sri Lankans going abroad comprises students leaving every year in large numbers particularly for higher studies. There are no reliable statistics to figure out how big the annual departures for studies are. But most of them are going to China, India, Malaysia, and Australia. Countries like the US and the UK are also attractive destinations for higher studies. It is not surprising that today even Bangladesh and Nepal have become popular destinations for higher studies particularly in the field of Medicine. n One-day service for those applicants who can obtain the passport on the same day by paying a higher price. n Normal service for other applicants who can obtain the passport within 14 working days by paying the normal price. In the Budget 2019, the fee of the one-day service was increased from Rs. 10,000 to Rs. 15,000 and the fee of the normal service from Rs. 3,000 to Rs. 3,500. It was only three years ago in the Budget 2016 that the passport fees were raised to the present levels. According to the available information, about 2,500 passports are issued per day, while about 60 per cent of the passport applications are for the one-day service. As long as demand is “less-sensitive” to the price changes, such instances are ideal for generating more revenue for the government by imposing taxes or raising the price. Economics students know that such demand is called “price-inelastic” demand. For whichever the reason, people don’t cut down purchases even when the price goes up significantly so that increased taxes and prices will generate more revenue. Consumers who are addicted to cigarettes and liquor are unlikely to cut down their demand for these commodities so it is a good place to generate revenue for the government imposing high taxes. Social attitude towards cigarettes and liquor as “bad and harmful” provides an additional justification for higher taxes on these commodities. There are certain important characteristics of “price-inelastic” commodities, enabling the government to generate revenue. These commodities are essential – even cigarettes and liquor are “essential” to those consumers who are addicted to them. There shouldn’t be “close substitutes” for the commodities enabling consumers to shift the demand. And the price shouldn’t be a “significantly large” share of income, compelling the consumers to ignore the price increases. How does it work for passports? Passports are essential to those who intend to travel abroad. There is no substitute for that or even any issuer other than the government. It is an ideal case for generating government revenue by charging a monopoly fee, and it could be made politically acceptable by splitting the service with price discrimination. As a result, the higher fees can be charged for the one-day special service with a justification that there is normal service too available at a significantly lower price. However, the applicants who need to obtain the passport urgently are unlikely to shift to the normal service. Apart from that there are other reasons for the passport applicants to choose one-day service over the normal service if their travel time and costs as well as many other factors as such are taken into consideration. Whatever the benefit that the passport applicants enjoy with the efficient one-day service, there is also a limit for the increase in price; it is not possible to raise it exorbitantly! When the price becomes a significant share of income, then there will be no demand for that.